Order 31 or more bentos and get a special price! See prices and menus below in "Bulk Bento Order" category. 50% of total amount is chargeable for any cancellation. The Sunshine Series with cooked vege selection is recommended for recovery patients. Suitable for cancer and kidney patients. 50% of total amount is chargeable for any cancellation. Care Series is a special selection created by AMGD and endorsed by the Health Promotion Board. 50% of total amount is chargeable for any cancellation. If your budget is over $1000, let CaterSpot negotiate exclusive discounts or custom order requirements on your behalf. 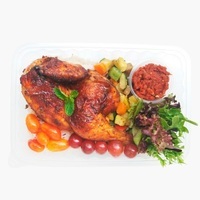 If your budget is over $1000, contact Caterspot to discuss specific food catering needs. "Food is always so fresh and tasty. Love the var..."
AMGD is a catering company that offers delicious and healthy food to their customers and is much loved by their customers. 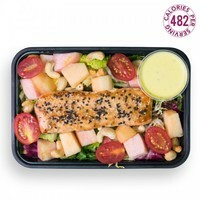 Their mission is to make authentic, delicious and healthy food for their customers along with their fast delivery. 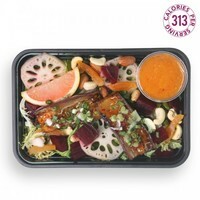 They believe that it is important to have tasty healthy food easily available to their customers to promote a healthy diet. AMGD also placed a strong emphasis on simple food selection process and delivery. AMGD's menu features healthy and hearty variations of salad, gran, pasta packed in lunch boxes and sharing platters! With their mouth-watering delicacies, they're sure to be your next favorite! Their popular menu includes 2BY2, HomePlatter and HelloDecember! 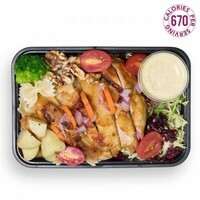 Their 2BY2's ingredients consist of traditional turkey roasted to perfection with a dazzle of with fresh rosemary herbs and corn mash with tossed carrots, cucumber & spring onions, on a bed of fresh greens, cherry tomatoes, strawberries, smoked almonds, golden raisins with cranberry sauce. Their HomePlatter's include Roasted Turkey with fresh rosemary herbs laid in a base of mixed greens, roasted sweet potatoes, steamed broccoli, cherry tomatoes and fruits like strawberries, blueberries and a mix of cocktail nuts, black seedless grapes, peaches drizzled with Cranberry Sauce. Their HelloDecember! 's ingredients consist of their signature traditional turkey roasted to perfection with fresh rosemary herbs in a bed of pumpkins and a side salad, Strawberry, Cherry tomatoes, Walnuts, Smoked almonds with their Special chef’s brown sauce reduction and Cranberry sauce. Looking to get AMGD delivered to you? Wrap & Roll delivery is available for breakfast, lunch, and dinner in Singapore. Make sure to check their schedule for delivery times, which is usually 5 days a week and do note that their menu requires 3-day notice for placing orders, so don't be disappointed! Thanks to Caterspot, you can have AMGD to cater to your needs and preference. You can simply place your order via our website. Alternatively, you can also call our hotline. Our friendly staff will be pleased to assist you with your booking or any enquiry. 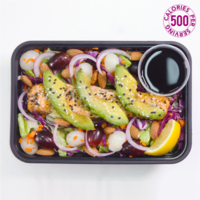 In Caterspot, we provide a seamless experience and convenience to our customers: once you have placed your order, you can count on us to deliver tasty and fresh AMGD menus to your location.